Sample Tanzania visa image. Courtesy Tanzania High Commission. Address: 307 East 53 street 4th, floor., New York, NY, 10022. Visa processing hours are Monday–Friday, 9:00am to 1:00pm for submitting applications, and 2:00pm to 5:00pm for picking up visas, with the exception of American and Tanzanian national holidays. No appointment necessary. Allow a minimum of five (5) working days for regular processing. You can now apply for an Online Visa to visit the United Republic of Tanzania (both Tanzania Mainland and Zanzibar). You are required to fill in the online form, make payment, and submit your application online. Your form will be internally reviewed and processed. Applicants will be notified through their e-mails whether their applications have been accepted or rejected. They may also TRACK their application statuses through the online system. You are encouraged to apply for an online visa as it should speed up your arrivals process. Visa requirements and costs for travellers to Tanzania have remained the same, and depend on the nationality of the passport holder. Tanzania visa on arrival facilities are available for US citizens. Payments may be made either by money order, cashier’s check, company/organization checks, personal checks (accompanied by copy of valid driver’s license or with driver’s license number written on the check), or credit card (all types accepted except for American Express). All checks and money orders should be made Payable to the Embassy of Tanzania, Washington, D.C. If you would prefer to pay by credit card, download the form for credit card payment here. Cash will not be accepted. Please note that the visa application fee is non-refundable. Please verify the latest charges on the Tanzanian Embassy website. Be sure you are able to track it. FedEx and UPS are accepted. Please verify that you have the latest forms from the Tanzanian Embassy website. Is Tanzania safe for Americans? While this post is about visa to travel to Tanzania, we have a more comprehensive post on African safaris and tours to Tanzania. To learn more about Tanzania safari tours and yellow requirements, visit our Tanzania Safari Holiday Guide page. The above information on Tanzania Visa for US Citizens is the best to our knowledge. We recommend you verify it with the Tanzanian Embassy in Washington, D.C. if confused. My husband and I will be submitting an application for a Tanzania Visa and we will be arriving from Kenya. We are U.S. Citizens. We have a Yellow Fever Certificate. When submitting our application, do you require the original Certificate or can we send a photo copy of it. Hi Arlene, this would vary from embassy to embassy. Request you to call them to verify. Visa on arrival is also available for U.S. Citizens. I have a question about proof of onward travel, does it have to be a flight or would a bus reservation to Kenya meet the requirement? HI Soco – a bus / shuttle reservation should work. A lot of travellers to cross into Kenya from the Namanga border checkpoint. 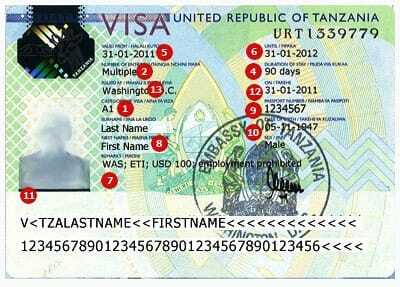 can I get a visa for Tanzania with travel document issued by USA?? Hi Adam – You’ll need a passport to get a visa for Tanzania. Good luck getting ANY information from the Tanzania Embassy in Washington, D.C. other than what is printed on their website. I have been calling and emailing for one entire week with absolutely no reply from the embassy, other than an automated email message telling me they will reply within 24 hours. Via phone I have called every extension on their menu. In each case the call went unanswered, and I could not even leave a message because every single voice mailbox was full!